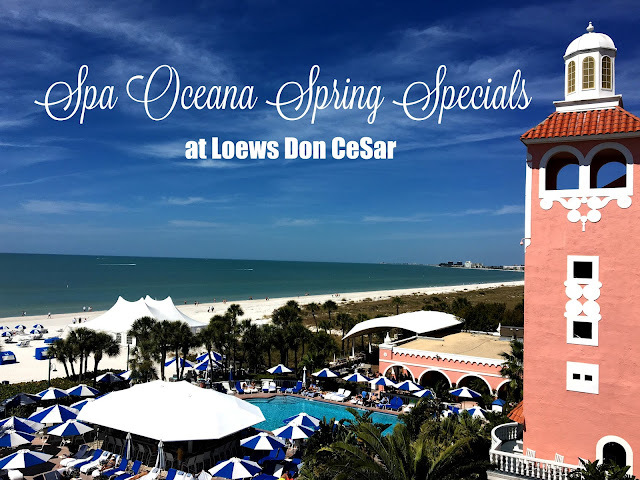 While visiting the Beach House Suites at Loews Don CeSar last week, my friend Amanda and I had a Spa day at Spa Oceana. It was the perfect way to spend an afternoon, getting pampered with a gorgeous view. If you live in the Tampa Bay area and are looking for the perfect day getaway, this is the place to go. The view is unlike any other Spa I have ever been to and the staff is five star all the way. We were welcomed with a glass of champagne, which we deferred to have for our lunch on the rooftop post Sea of Life Facial. The Sea of Life Facial is one of the specials on Loews Don CeSar Spring Specials. It is a fantastic facial for those looking to unwind and has 17 different oSea products used during the 90 minute procedure. Your esthetician uses a variety of seaweed products found in Patagonia. If you have shellfish allergies, there is a variation of this procedure as Amanda was able to experience. The 90 minutes left my skin feeling amazing. Following the facial, Amanda and I regrouped on the balcony for a delicious spa lunch. On the far right is my salad - the Farmers Salad with artisan greens, strawberries, walnuts and raisins. I switched out my bleu cheese for brie and added chicken. Amanda ordered my favorite grouper sandwich of all time - the Gulf Grouper Sandwich, with roasted tomatoes, arugula and seven grain bread. Amanda's husband Travis ordered the Joyce Farms chicken with roasted brussels sprouts and quonia. As I mentioned, we chose to have our glasses of champagne at lunch, so of course we took the time for a champs photo opp! This is a personalized treatment that combines custom cleansing and a restorative mask with biodynamic Cranial-Facial Therapy. As you breathe in a relaxing rhythm, all face, jaw, and neck tensions melt away and a feeling of peace and well-being flows in like the tide. We invite you to discover the healing powers of the most potent natural ingredients from Earth and Sea, to feel amazing, look radiant, and bathe in the Sea of Life! Revive your skin with this scrumptious pear scrub that will whisk away dry cells, leaving skin soft and supple. A luscious application of Honey-suckle Custard nourishes the skin to glowing perfection! Begin your journey with a Clementine sparkling soak rich in antioxidant grapeseed oil. Next, you’ll be whipped into silky-fine softness with a coconut shea butter sugar scrub revealing vibrant, quenched skin. Leave moisturized with ginger and grapefruit oil that’s reminiscent of a creamy, delicious sorbet. This ritual treatment includes a one-on-one consultation and hair diagnosis conducted by a hair care professional, for a truly customized and unique service that will bring out your hair’s inner radiance. Complete your transformation with a haircut. Purchase any Gift Card with a dollar value of $150 or more and receive a complimentary $25 voucher to use towards a future spa service. Restrictions Apply. Experience a 60 minute facial and receive a complimentary eye and lip treatment. Indulge in an Ocean Mist Pedicure and receive a complimentary polish change for your hands! Bring a friend! When you visit together for a 60-minute service each, add a complimentary 30-minute service the same day. Book any 60 minute Spa Massage or Facial and add your choice of a complimentary fitness or yoga class. Schedule any three 30 minute services from our Happy Hour Menu of services for only $149. Receive a complimentary conditioning masque and 10% off all Kerastase products with any blowout. Pamper yourself with both a 60 minute massage and facial and receive a 15% discount toward all your Spa purchases. ASICS Vine Body Sole Half Marathon #Giveaway!